Mr. Media is recorded live before a studio audience in the year 2000 – I mean the year 3000… in the NEW new media capital of the world, St. Petersburg, Florida! If it has anything to do with what’s unknown about tomorrow, Rob Kutner’s probably got a made-up word for it. Let’s set aside pretense and be honest: Rob Kutner knows as much about the future as you or I. The difference between him and us, however, is that he is certifiably funny. Kutner just published an ebook, The Future According to Me, that makes a sweet addition to his growing library of product, including Apocalypse How and his contributions to Jon Stewart’s bestselling work, America. Speaking of Stewart, Kutner was a four-time Emmy Award-winning staff writer for “The Daily Show” before joining Conan O’Brien on “The Tonight Show” and his new late night show on TBS, “Conan.” Before those gigs, he wrote for “Dennis Miller Live” on HBO. You know, back when Miller was still funny and had something the average person would recognize as a career. At least Kutner’s future is bright! 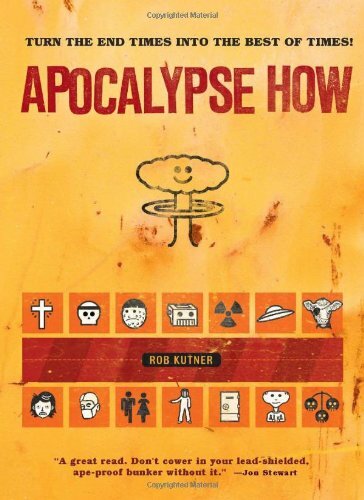 Order ‘Apocalypse How: Turn the End-Times into the Best of Times!’ by Rob Kutner, available from Amazon.com by clicking on the book cover above!